Is Test Track closing for refurbishment? When booking Fastpass for our Mouse Class Travel clients, I’ve noticed that Test Track is showing as unavailable for certain dates in the future. This usually points to a potential closure for refurbishment. I noticed that Test Track Fastpass is widely available on January 31, 2019, but becomes unavailable on February 1, 2019. I did see a single Fastpass on February 2, but then it totally disappears again February 3 onward. Disney has not posted a refurbishment for Test Track, but the lack of Fastpasses is usually our first tip. Disney also does not list the Magic Kingdom railroad or Animal Kingdom Wildlife Express, so it is not fully reliable. Test Track never runs out of Fastpasses in the 30-60 day window. If you’re booking Fastpasses for Epcot in February, it’s likely that you’ll notice that Test Track is currently showing as unavailable. I went in this morning for a trip the week of 2/16/19 and Test Track showed unavailable when I tried to book for my whole group of 5. For the heck of it, I tried to book it for just 1 person and it showed me times. I was able to go back in to that reservation and add 1 person to that reservation, and then go back in to add 1 more. The system apparently thought I was being greedy at that point and wouldn’t let me add a 4th person to that reservation. But I was able to book my 4th person individually and then add my 5th person to that second reservation. The two fastpass reservations overlap by 45 minutes. Time consuming and held my breath every time it went into think mode, but I’ll count it as successful. Hope this helps anyone looking to snag Test Track until they fix it. Today I was able to make fastpasses for Test Track for our Epcot day in the first week of February (when I had tried last week there was very little availability). It appears they released more fastpasses for Feb. 1-16. Not sure if they will do the same, at some point, with the rest of February. I was unable to make 4 Test Track fast passes on February 3, which was our 60 + 3 day. We’re planning to either rope drop it or single rider line it, assuming it’s open – who knows! Interesting to see others are having trouble too. Thanks! Actually, was just able (today) to change our Soarin’ fast passes into Test Track fast passes for February 3. So maybe they’ve opened up some more now, or fixed whatever glitch was occurring? I have club level fastpasses for Test Track on February 8th which I made on the 90 day mark. Couldn’t add additional guests when I called on day 61. I was unable to make fastpasses for Test Track on the 4th of February. So if you are club level you are allowed to book fastpasses before everyone else? Pretty sure they can. Might be with the charge where they get the 3 extra passes too. When we booked our FP’s last Tuesday for 2/4 it was available but only the later times were open. Now that’s not saying that Disney didn’t change their minds because they can and will if needed. My Epcot day was 60 plus 7 and i was unable to get a fastpass for 6 people. I changed it to 2 groups of 3 & was able to get it that way with overlapping times. Hopefully it is just a glitch. I called Disney & they could not tell me why I was having any problem with booking it. He said just to keep checking back. Hopefully it isn’t down too long. We visit in March. I have a FP for 2/24 through club level program. But it was not available 90 days out, it came through a few days later. I’ve been wondering the same thing. I did manage to get one for my husband & myself for February 1 & again for February 4, but they were really difficult to get, which is really odd for Test Track. 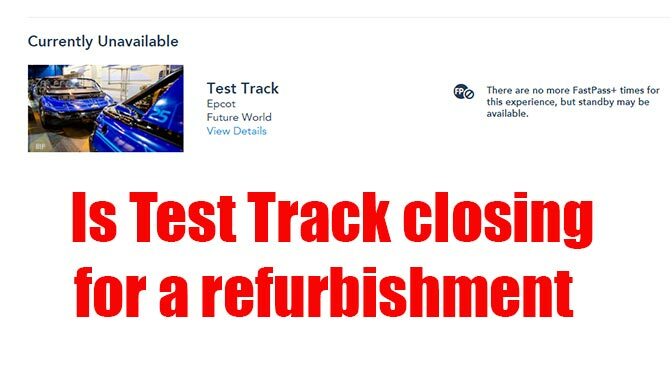 What will happen with our Test Track FP’s if they do close for refurbishment for that time period?